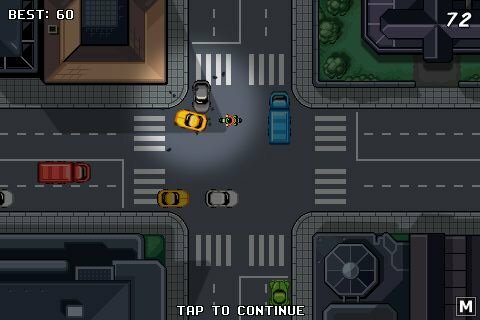 Traffic Rush is a very easy to play traffic management game. You are presented with a four-way intersection, and it’s up to you to make sure traffic keeps flowing. There are no lights and no stop signs, just you and your wits to make sure there are no collisions.Once the game loads, you’ll be presented with the Main Menu. Start begins a game and More Games closes the game and opens Safari taking you to a page with information on the developer’s other games. I would have preferred that they have a confirmation dialogue on whether or not you wish to leave the game to view the website in case you accidentally press this. The final menu selection is Options. 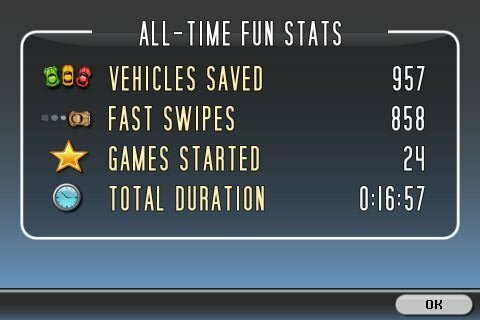 Here you can turn the sound on or off, get directions on playing the game, and view “Fun Stats”. This game is super simple to play. The cars don’t make any turns and you don’t have to draw any paths guiding them to a destination. Your job is strictly traffic control. Simply swipe a car to send it zooming across the intersection, and tap on it to make it stop. Unfortunately, these are some very impatient drivers. A stopped car will begin flashing its headlights after a few seconds and then it will take off irregardless of any traffic in front of it. The cars also move at different rates; there are speedy sports cars, rumbling trucks, motorcycles, and clunkers. Each one has its own set base velocity and “swiped” velocity and this will add to the difficulty of keeping things flowing. Also, the number of cars gradually increases as you play so you’ll have to think and flick quickly. If there’s a single collision, that’s game over for you. One thing that is really helpful is the “M” in the lower right. This pauses the game and also allows you to quickly restart a game. This is great especially if you know you haven’t broken your current record. If you select “Tap to Continue” you’ll be shown a summary screen of your game and then you will be taken back to the Main Menu. I would love to see an unlockable map or two that would add to the challenge of the game. One could simply be the addition of a 3rd lane of traffic in each direction on the main horizontal road; another could be a traffic roundabout or maybe two 4-way intersections connected by the main thoroughfare. To me, the simplicity of the game has its own charm. Games are super quick and are a matter of juggling different objects moving at different speeds in two different directions. When you don’t want to settle in for a potentially long game of landing airplanes, docking boats, or juggling cargo and pirates, then this is a fun and simple alternative. I would recommend this game if you want something quick and easy to play and have perhaps only a few minutes at a time to play or may be frequently interrupted. This is definitely a good “bathroom break” game. Entries (RSS) | Comments (RSS) | 74 queries in 0.573 seconds.